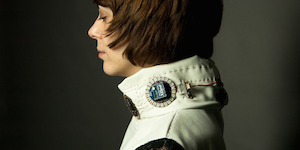 The wearable prototype was conceptualized and developed by Afroditi Psarra during a ten day residency on May 2014 at IAAC (Institute of Advanced Architecture of Catalonia) and Fab Lab Barcelona, curated by textile department co-ordinator Anastasia Pistofidou, part of the research project EASTN (European Art Science and Technology Network). The interactive bodysuit's design focuses on modularity and the idea that during the performance, the performer can add or remove the sensors, playing with the sound qualities that each sensor represents. The looseness of the suit on the neck and on the hips is inspired by the work of pioneer contemporary dance choreographer Martha Graham and her piece Lamentation, which features a stretch cylinder garment. The suit becomes tighter close to the sensor joints transforming into a second skin. The cutouts permit a look to the body's interior and the sensors represent the muscle joints. The bodysuit consists of a white cotton-lycra elastic bodysuit of five different pieces and four neoprene bend sensors that have been custom-made and are wrapped with an elastic vinyl flesh colored fabric. The prototype was created with the valuable help of fashion designer Claudio Marzá Compte. The sensors design is based on the open hardware Neoprene Bend Sensor by Plusea, customized to the desired form and slightly modified so that both connections - power (vcc) and ground (gnd) are connected to snaps facing to the upper part of the sensor so they can be easily attached and de-attached. The sensor requieres a pull-up resistor in order to work properly. For this project I am using the LilyPad' s internal pull-up resistor directly declaring it in the Arduino code, using the pinMode(sensorPin, INPUT_PULLUP); command.